Below is another patient of Dr. Vardy's whose molar was lost yrs ago, with the back molar tipping into the missing molar space. 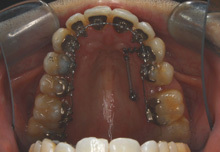 Dr. Vardy placed a TAD and limited posterior braces to upright the molar for future implant replacement. The remaining orthodontic issues will be corrected using Invisalign Technology (a series of clear plastic aligners that sequentially move the teeth into ideal positions). The next patient of Dr. Vardy's was treated with a TAD and braces behind the teeth, in an effort, not to disrupt the back molar good position, while closing the space. There are many instances that TAD's may be used today in orthodontics to move teeth more comfortably, in less time and using the appropriate biomechanics needed to move the teeth ideally. Please call to schedule a consultation with Dr. Vardy at 212-579-6881 to learn more!